When Vegas magician Buddy "Aces" Israel ends up in hot water with the mob big-wig Primo Sparazza sends 6-hitpeople for his heart. What ensues is an ultraviolent crime-thriller with a very disappointing end. Smokin' Aces starts out like a typical "catch the snitch" hitman flick and then very quickly tries to turn into a human drama where everyone is covered in blood and killing each other. Emotionally the film is all over the place and extremely confusing at times. Every character ends up stabbed, beaten bloody, shot, or otherwise maimed or just plain old dead. The ensemble cast doesn't really work here because they all bring the same thing to the table, lots of moaning in pain from their injuries or just laying there being well...dead. There are 3 elements of this movie that did catch my attention though. 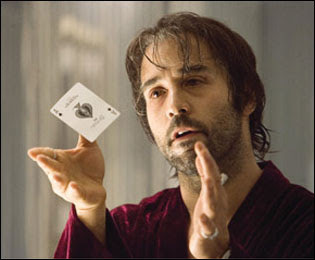 First Jeremy Piven was GREAT as Buddy "Aces" Israel he really brought some depth to the role and was one of the only things that kept me watching as the film spiraled into it's bloody finale. Second was Ryan Reynolds actually playing a different character than the lovable dork who can't catch a break from the ladies. He really impressed me as an FBI agent. And finally Matthew Fox in the funniest cameo I have ever seen sporting a mullet and unabomber mustache playing head of casino security, Bill. check out his pic here. So is this Lucky Number Slevin wannabe worth watching? Not on your heart, not even on Buddy Israel's heart come to think of it. If you want an entertaining crime flick that's worth your time intellectually check out Brick or Lucky Number Slevin before this bloodbath that tries to redeem itself with a blatantly obvious twist.